Samsung has launched the Galaxy Experience Program in South Korea. The program allows iPhone users to test the Galaxy Note 8 and the Galaxy S8 for a month. There’s a nominal participation fee for the program which is refunded after the trial period ends. Some conditions do apply, though. The launch of Samsung’s Galaxy Experience Program coincides with the release of Apple’s latest iPhones in South Korea. Samsung would obviously like people to opt for its flagship handsets instead. Interested iPhone users in South Korea can apply for the Galaxy Experience Program online from November 21-27. Samsung will pick 10,000 people by November 30. 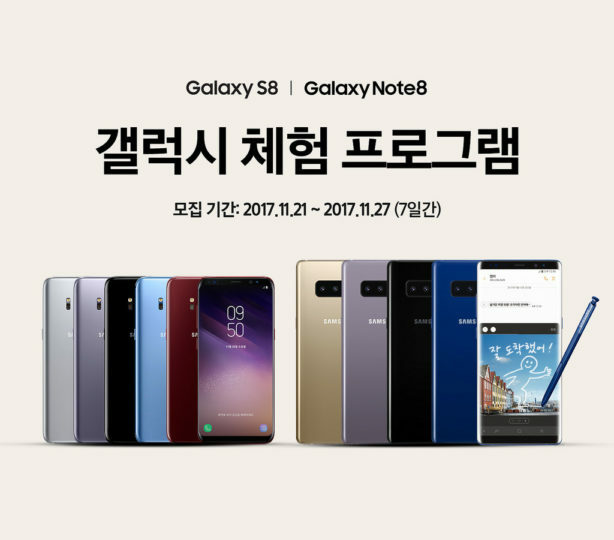 Those who are selected will have to visit the Samsung Digital Plaza from December 1-11 and subsequently purchase the Galaxy Note 8 or Galaxy S8. There’s an additional participation fee of 50,000 or $45. The participation fee is refunded after one month if the customer decides to keep their Galaxy smartphone. If the customer decides to return it, they will be refunded the cost of the device but not the participation fee. Customers who switch to a Galaxy smartphone will not only get their participation fee back but they will also receive freebies like JBL Go Bluetooth speakers. The program will enable iPhone users to experience Samsung’s flagship smartphones for essentially $45. They can decide after a month if they want to keep it, therefore, they don’t have to feel sorry for burning almost $1,000 on an unwanted smartphone. Have some confidence in your own products, if Sammy think Galaxy series is superior than iPhone, there no need for such move, the products will sell by itself. By having such program in line with iPhone X launch in Korea and even mocking Apple using the ads is kind of childish and show that Sammy is scare of Apple iPhone X launch even at its home ground. For next years flagship yes!